In this Photoshop photo effects tutorial, we'll learn how to create a simple three-image photo frame, and when we're done, we'll see how to easily convert the final result into a reusable template using Photoshop's Smart Objects! 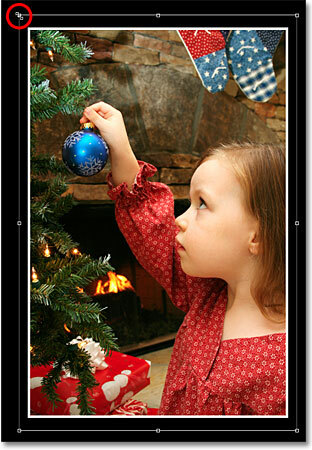 Smart Objects were first introduced in Photoshop CS2, which means you'll need Photoshop CS2 or higher for the final steps in the tutorial. I'll be using Photoshop CS4 myself. 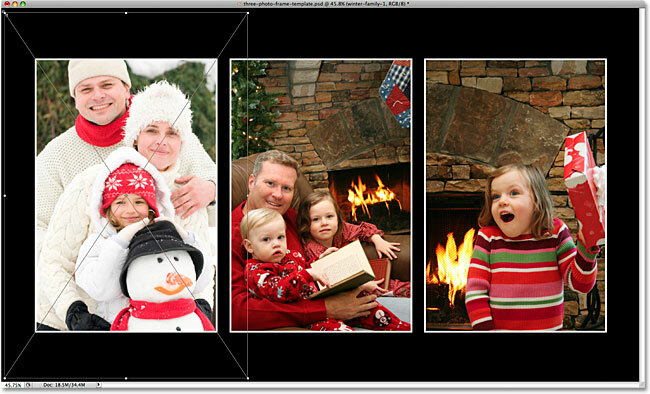 However, if you're using an earlier version of Photoshop, you can still create the actual photo frame itself. The only thing you won't be able to do is convert the images into Smart Objects at the end of the tutorial. Go to File > New, or press Ctrl+N (Win) / Command+N (Mac). Create a new 12 inches x 6 inches document at 300 pixels/inch. The document now filled with black. Change the name of the new layer to "placeholder left". A new layer named "placeholder left" has been added. Change the Style to "Fixed Ratio", then enter "4" for the Width and "6" for the Height. Click and drag out a selection around the area where the photo on the left will appear. This time, change the Use option to "50% Gray". Press Ctrl+D (Win) / Command+D (Mac) to remove the selection outline once you've filled the selection with gray. Click on the Layer Styles icon and select Stroke from the list. Change the color of the stroke to white, then increase the Size to around 10 px and change the Position to "Inside". Layer Styles are an easy way to add simple effects like borders to an image. Press Shift+Alt (Win) / Shift+Option (Mac) and, while holding both keys down, click on your gray shape inside the document and drag it towards the right. The Alt / Option key tells Photoshop that we want to create a copy of the shape as we drag instead of moving the original shape, while the Shift key limits the direction that we can drag in, making it easy to drag in a straight line towards the right. Hold down Shift+Alt (Win) / Shift+Option (Mac) and drag a copy of the shape into the middle of the document. Step 10: Rename The New Layer "Placeholder Middle"
The new shape appears on its own layer above the original. Rename the new layer "placeholder middle". Try to leave an equal amount of space between the third shape and the right edge of the document as there is between the original shape and the left edge. Step 12: Rename The New Layer "Placeholder Right"
Rename the new layer "placeholder right". Hold Shift and click on "placeholder left" to select all three placeholder layers at once. Click on the "Distribute Horizontal Centers" icon in the Options Bar. The placeholders are now spaced out evenly. We're ready to add some photos to the document. We'll do that next! The first photo I'll be adding to the document. 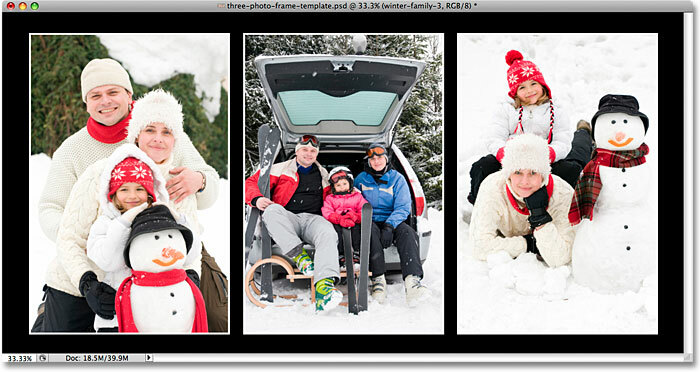 Press Ctrl+A (Win) / Command+A (Mac) to quickly select the entire photo. You'll see a selection outline appear around the image. Then press Ctrl+C (Win) / Command+C (Mac) to copy the image to the clipboard. You can close out of the photo's document window once you've copied the image to the clipboard. Select the 'placeholder left' layer in the frame document. Pasting an image into another document places the image on its own layer above the layer that was selected. We've successfully added the photo to the document, but it's in the wrong location and hidden behind the middle placeholder shape. Click and drag the photo over the "placeholder left" shape. The photo is now 'clipped' to the placeholder shape below it. Let's resize the photo so that we can see the entire image rather than just whatever part happens to be over the placeholder shape. Press Ctrl+T (Win) / Command+T (Mac) to quickly bring up Photoshop's Free Transform box and handles around the image. Even though we can only see the area of the photo that's directly over the shape, the Free Transform handles appear around the actual dimensions of the image. If you can't see the Free Transform handles because your image is so large that the edges extend out beyond the visible area of the document window, press Ctrl+0 (Win) / Command+0 (Mac) to have Photoshop zoom out until everything fits inside the document window (known as the Fit on Screen view). Press it again when you're done resizing the image. Drag the corner Free Transform handles inward until the photo is the same size as the placeholder shape. The photo is now the same size as the placeholder shape below it. 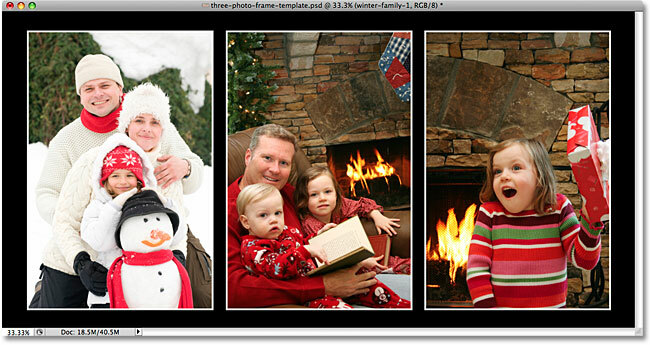 Follow the same steps to add two more photos to the frame document, one for the middle area and one for the right. First, open the photo you want to use. Press Ctrl+A (Win) / Command+A (Mac) to select it, then Ctrl+C (Win) / Command+C (Mac) to copy it to the clipboard. Close out of the photo's document window once you've copied the image to the clipboard. Switch back over to the frame document and click on either the placeholder middle or placeholder right layer in the Layers panel to select it (depending on which one you're adding the photo to). Press Ctrl+V (Win) / Command+V (Mac) to paste the photo into the document. 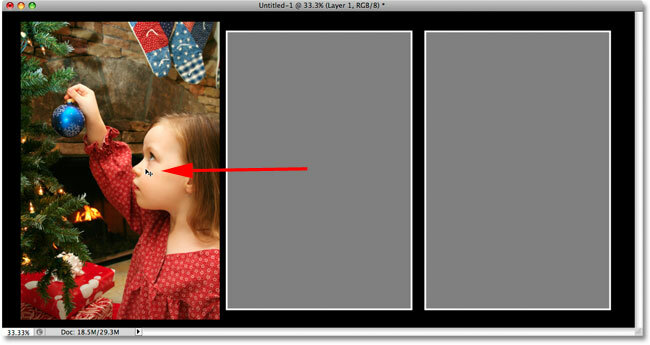 Photoshop will place the photo on its own layer directly above the placeholder layer you selected. Use the Move Tool to drag the photo over top of the placeholder shape if needed, then go up to the Layer menu at the top of the screen and choose Create Clipping Mask. Finally, press Ctrl+T (Win) / Command+T (Mac) to bring up the Free Transform box and handles around the image. Hold down your Shift key and drag the corner handles to resize the photo. Press Enter (Win) / Return (Mac) when you're done to exit out of Free Transform. For these remaining few steps, you'll need Photoshop CS2 or higher to follow along. 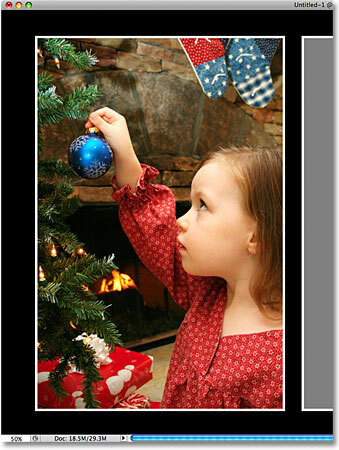 We're going to see how easy it is to use our final result as a template, swapping other photos in and out of the frame as needed using Smart Objects which were first introduced in Photoshop CS2. Click on "Layer 1", which contains the first photo we added. Choose "Convert to Smart Object" from the menu. A small Smart Object icon appears in the layer preview thumbnail. Do the same thing for the remaining two images (which you'll find on "Layer 2" and "Layer 3"), first clicking on the layer in the Layers panel, then Right-clicking (Win) / Control-clicking (Mac) on the layer's name and choosing Convert to Smart Object from the menu. When you're done, all three photos should have the Smart Object icon appearing in the bottom right corner of their layer's preview thumbnail. Select "Layer 1" again, then Right-click (Win) / Control-click (Mac) and choose "Replace Contents" from the menu. Click on the name of the photo, then click Place. 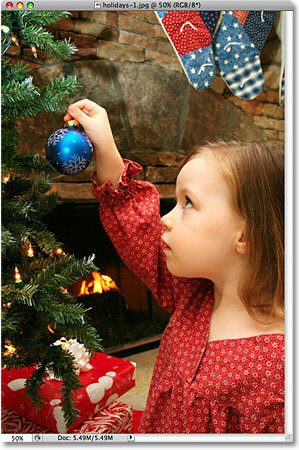 If the new image appears too large, resize it with the Free Transform command. The left photo has been replaced. Do the same thing for the other two photos to swap them with other images. 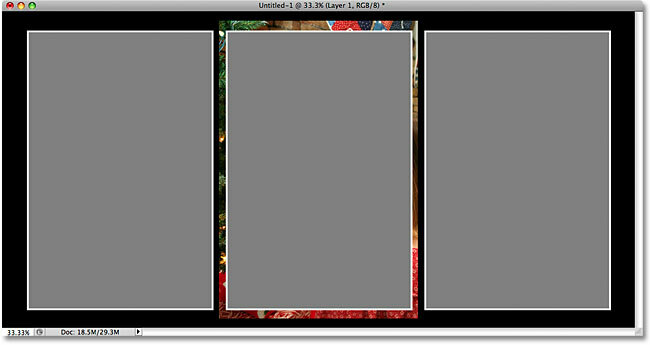 First select the photo's layer in the Layers panel ("Layer 2" or "Layer 3"), then Right-click (Win) / Control-click (Mac) on the layer's name and choose Replace Contents from the menu that appears. When the Place dialog box pops up, choose the new photo you want to use, then click on the Place button. If you need to resize the new image, press Ctrl+T (Win) / Command+T (Mac) and drag the Free Transform corner handles, holding down Shift as you drag. Press Enter (Win) / Return (Mac) when you're done to exit out of Free Transform. Replacing the original images with new ones was easy thanks to Smart Objects! Make sure you save the document as a Photoshop .PSD file when you're done so you keep the layers and Smart Objects intact, ready for the next time you need to re-open the file and add new photos! And there we have it! 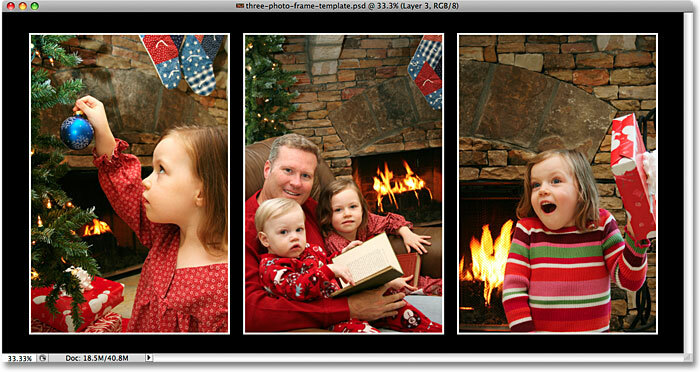 That's how to create a three-image photo template using Smart Objects in Photoshop! Visit our Photo Effects section for more Photoshop effects tutorials!